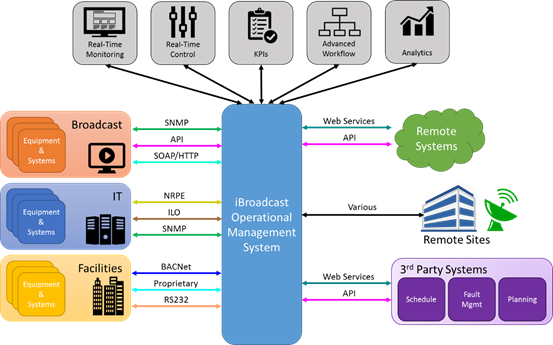 iBroadcast is a flexible, comprehensive, scalable, end-to-end, multi-vendor Network Management System (NMS) that is capable of monitoring and controlling your entire broadcast platform. This enables your operations teams to take timely, decisive action in response to issues that may affect service uptime or other operational performance. Across studios, MCRs, playout systems, glue, headends, uplinks, terrestrial transmitters, IT infrastructure, building management systems and many other third-party applications, iBroadcast is designed to be your single, consolidated, real-time operational dashboard. Faster, more accurate problem solving and trouble shooting. Smart alarms that can prioritise severity level improve use of time and resource. Empower operators and ensure correct procedures are followed in the event of a platform performance issue. Remove risks associated with taking an incorrect action, prioritise and capture useful data. Can be used as a template to replicate successful ways of working across the business. Faster, more straightforward reporting, using fewer resources. Useful insights – greater awareness of areas for improvement. Rapid recall of data for long-term trending and historical event investigation. End-user can configure, expand and manipulate the system from any location. Rapid integration of additional system components from any vendor as needed.